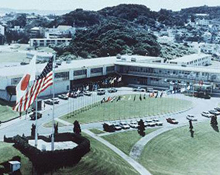 Camp S. D. Butler located 300 miles due south of mainland Japan on the island of Okinawa. MCB Camp S. D. Butler is home to: Camp Kinser; MCAS Futenma; Camp Foster; Camp Courtney; Camp Hansen; Camp Schwab; and Camp Gonsalves. Okinawa is also home to four other USMC major subordinate commands.